I mentioned The Afterword Reading Society on the blog the other day and was inundated with questions (two people asked me questions.) I’ve experienced some confusion myself, so today, to paraphrase Weird Al, we’re going to dig deep and peel back the layers and find out what goes on in this secret Society. When you sign up, you will receive weekly-ish emails, either inviting you to read the next selection, or, to answer another bookish question. Those emails are signed off by Afterword editor Mark Medely, who assures me that they randomly select 25 people to read each week’s book, and do not just taking the first 25 to request, as I suggested – after months of trying, I finally made it when I happened to be in Gmail when the email arrived, and clicked through within 5 seconds. Once you’re picked to read, it all happens pretty quickly. I was notified on March 7, received my book on March 17, and had to read it and answer a list of questions by April 2. I’d just finished a book or two the day it arrived, thank goodness, otherwise that could have been dicey! Plus, I like to let a book sit for a while before I write about it (hence I’m always months behind in my reviews.) But I loved this book and read it really quickly, and even had my answers in a few days early. Here are the questions and my responses. I think the questions are the same for every book. Rate this book with a score between 0 and 100. I read All Our Names in ____ sittings. 15 or so. I get interrupted a lot. What was better: the beginning or the ending? The ending. The last sentence killed me. Helen. She was quirky without being twee and had some of the best lines in the book. She had me nodding and cringing all at once. Without your family, your past, and your home, who are you? Identity haunts this story of revolution, betrayal, and love. If you like this book, you’ll like (name another book). Why? Half-Blood Blues by Esi Edugyan because displacement, identity, and betrayal are at the heart of her story of WWII. What’s a question you have for Dinaw? 1. Could this story have happened in another setting, in a another time? During another revolution? Or, is it specific to this revolution and this time and place in American history? 2. After you tweeted your response to his criticism of All Our Names, Aaron Bady tweeted “Note to self: before I have an opinion about a writer’s work, remember to check with the writer first.” What do you think about authors responding directly to criticism? Would you do it again? Bonus: We want to know a bit more about our members. So, who’s your favourite author? Hard to name one. If pressed, David Adams Richards. Here is the article in The National Post. My “sum up this book in a Tweet” made it in! I was a bit of a weirdo in my other answers – other readers liked the beginning best (WHAT?) and liked Isaac (understandable, main character.) I really loved this book and will get to a full review – eventually. 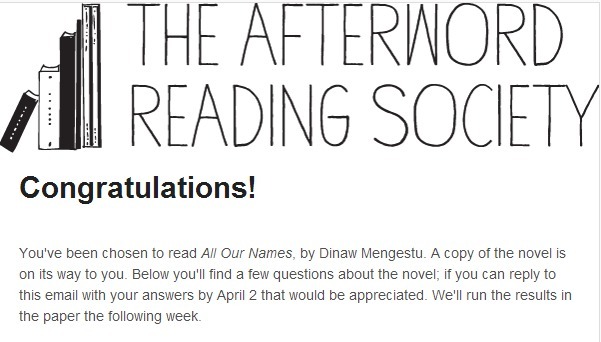 And, despite my dislike of short deadlines, I will (try to) do The Afterword Reading Society again, because I want to get an author question in next time! Oh, and if you’re in Edmonton and have the National Post books section from this weekend, let me know. I forgot to buy it and who knows if I will ever have my name in a newspaper’s book section again? This sounds like fun! The short deadline would feel like a lot of pressure, though. It’s great that you liked the book so much. Now I want to read it just for that last sentence! Love your sum-up, as well as the one by Natalie Hamilton. It is a lot of pressure. If I get a request for a review or book tour with a deadline like that (ahem, Penguin) I turn it down. But I was really curious about this whole process, hence the post about it! Very cool – oh and that last sentence still leaves me wanting more…. Reading reviews, I’m noticing people take the ending different ways (not so much that sentence but how things end for Helen and Issac) – I thought it was a hopeful/optimistic ending, but some people think it was a sad ending… how did you read it? I agree that it was hopeful and optimistic… It technically didn’t have a happy ending, but, I read it as a happy ending, kind of like things had come full circle. Oh, this is really cool. I’ve been wondering about The Afterword a bit. I don’t really read the National Post, but they do have really good book coverage, so i sneak a peak at the website about once a month. And I love Mark Medley. 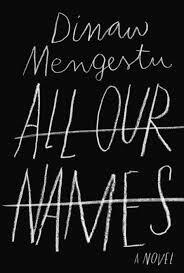 Can’t wait to read your review of All Our Names. Oh god!! I was relieved that All out Names was under 300 pages. Let me know. Juice and marker stains are acceptable!